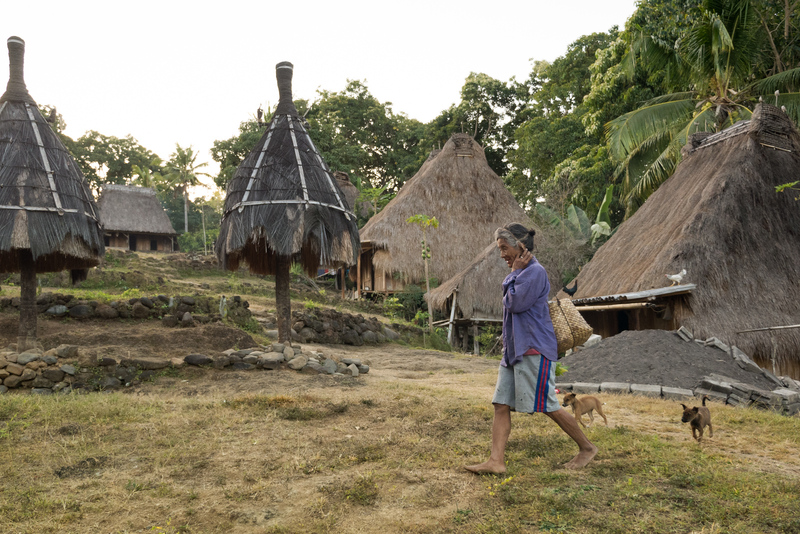 When we were doing research for the island of Flores, we knew we wanted to stay in and visit traditional villages. Beleraghi Village was on our way to Bajawa and made for a good place to stop and stay overnight after traveling from Ruteng. With Flores being a very mountainous island, getting from one town to next usually took all day. The roads were narrow, curvy, and the locals call it the “snake.” Finding Beleraghi is not easy, as it is not on the tourist route and you would have to be either traveling by motorbike or hire a private driver to reach it since it is on the other side of the mountains from Bajawa. After spending the day traveling from Ruteng, our driver turned off of the Trans-Flores highway when we neared the town of Aimere. He could only take us to a certain point, after which we would have to hike the rest of the way to the village. Once our guide arrived, we headed up the trail towards the village. Having hiked up the very steep and strenuous 9 km trail to Wae Rebo Village a couple of days before, this 3 km trail seemed much easier by comparison. The beautiful landscape surrounding us made it even easier by constantly keeping us distracted. 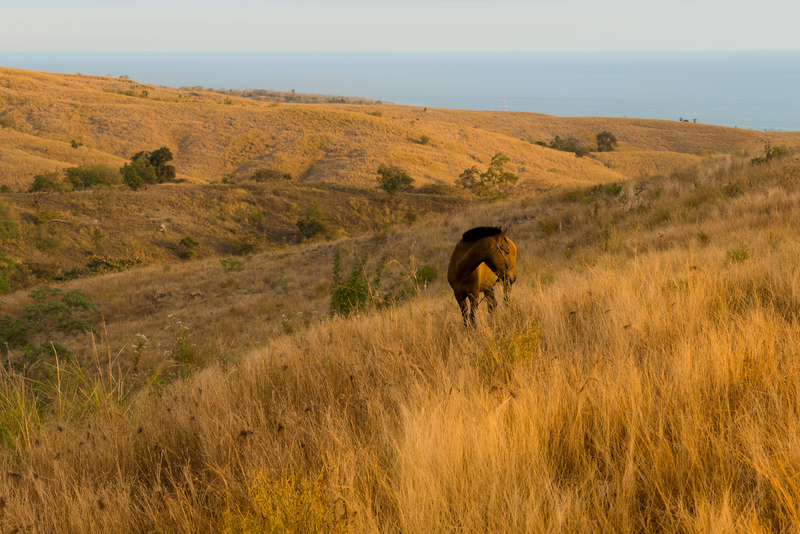 A view of the ocean and horse grazing the field on the way to Beleraghi Village. The village elder heads to Beleraghi Village. 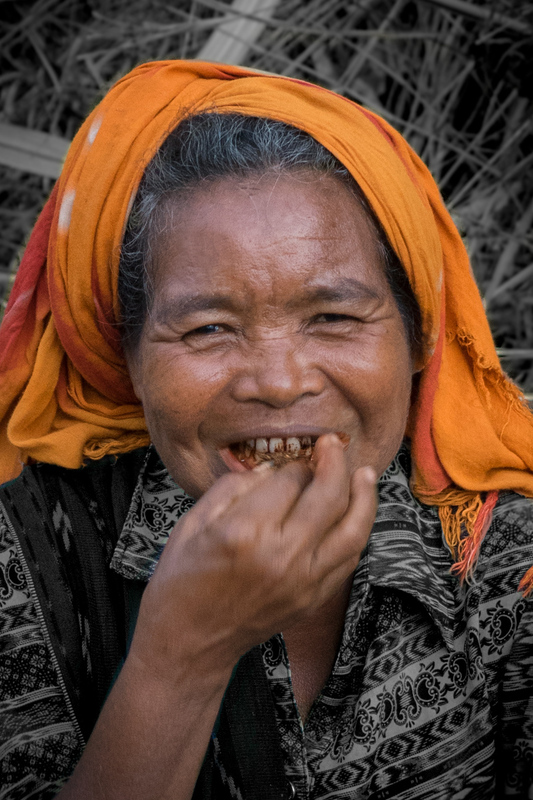 A woman rests while chewing betelnut on the way to Beleraghi Village. 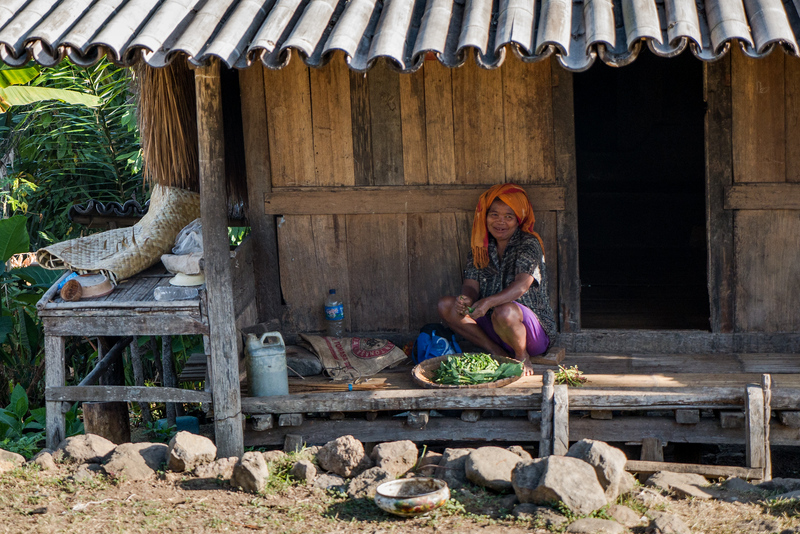 Once we finished hiking the trail, we were greeted with a warm welcome as we entered the village. Having ridden in the car all day, we were a little tired, but as the hidden village came into view, our weariness went away and we felt like we had discovered a hidden treasure on the island. The village consists of sixteen beautiful traditional houses, located in a forest clearing which gave the village a feeling of being in harmony with its surroundings. Sitting in parallel rows, the houses are renovated on a regular basis so the villagers can ensure that their culture values are well maintained. Five of the sixteen houses are sao pu’u, first or original houses, indicated by a miniature house on the roof. Another five distinct houses are sao lobo, last houses. These have a miniature human figure on the roof. There are five clans that live in the village at the present time. Each clan has its own sao pu’u or sao lobo. The traditional houses of Beleraghi Village. 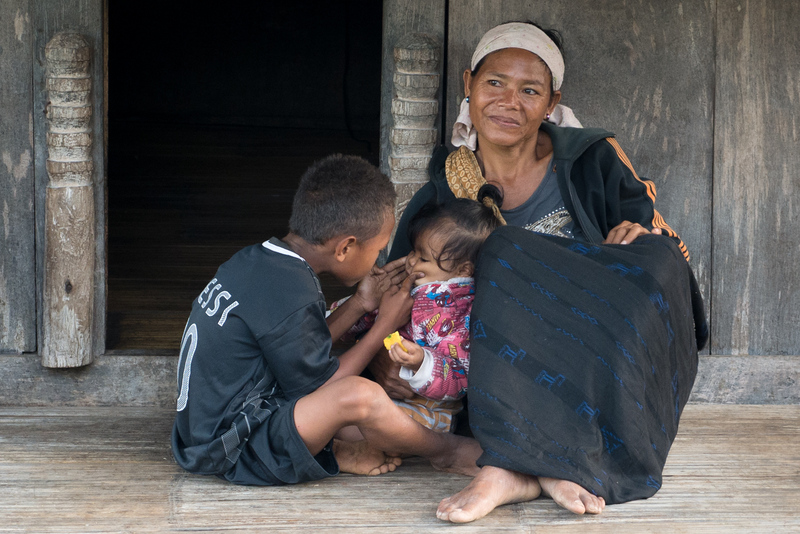 Ngada people refer to their village as Nua in the local language. 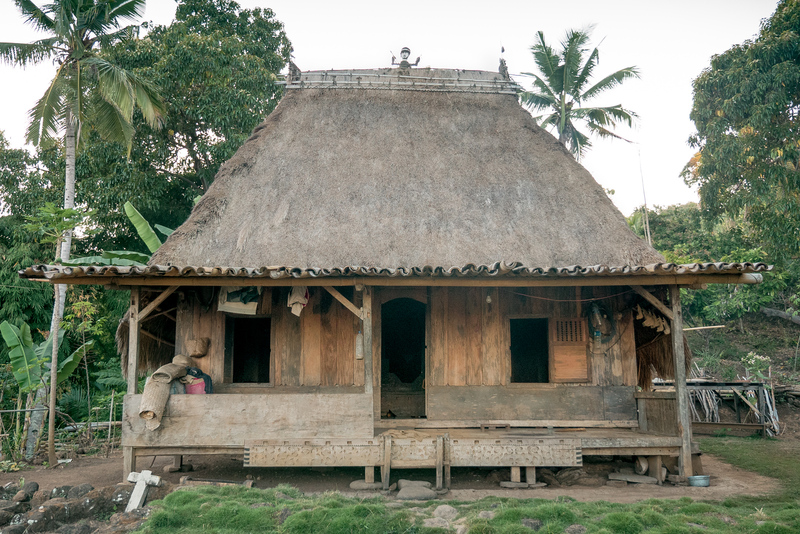 A Nua consists of traditional houses which are owned by different clans. 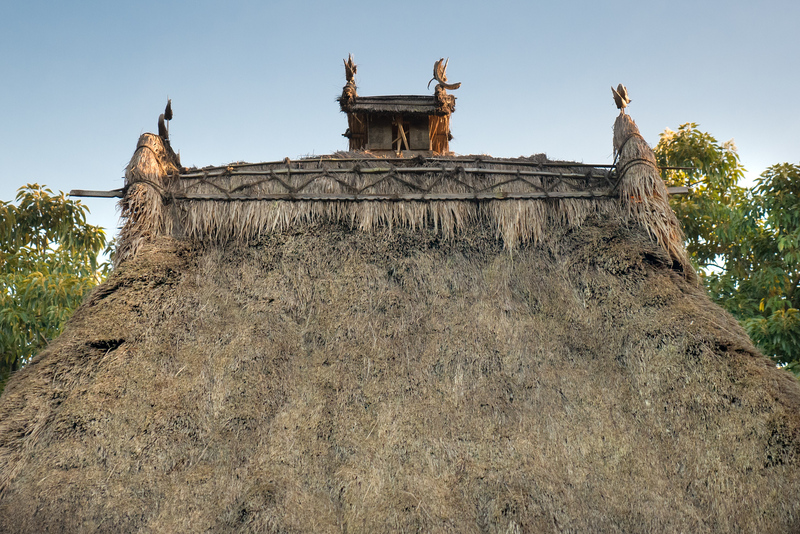 Along with the houses, each clan also owns a pair of ancestral shrines ngadhu and bhaga which are located in the center of the Nua. Arrangements of megaliths are located to the shrines. Ngada people do not consider the house as just a place of residence. The houses are differentiated between ordinary buildings and ceremonial houses. A ceremonial “great” house, or sa’o meze, is linked with one clan and named along with the clan’s place of origin. This is where a clan gathers for ceremonies and ritual occasions. One of the first or original houses called a sao pu’u as indicated by a miniature house on the roof. 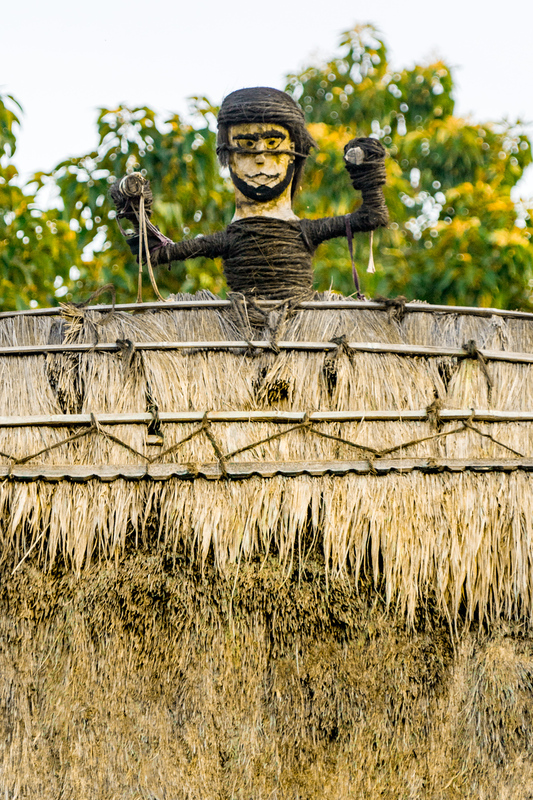 A sao lobo or last house symbolized by a man on top of the roof. Detail shot of a sao lobo symbol. The sa’o meze is divided into three parts. The outer veranda is a public place where daily activities are done, such as weaving. The inner veranda is a private space and where guests sleep. That was where we would be sleeping. The spiritual center and most sacred of a ceremonial house of the is the hearth which is separated from the inner veranda by a small door and stairs. Not only is the hearth considered to be the resting place for the ancestors, it is also where a woman gives birth, ritual performances are conducted, and sacred objects are stored. These objects include swords, digging sticks, woven cloth, and palm wine. A woman walks in front of ngadhu and bhaga shrines in Beleraghi village. When we arrived in Beleraghi near dusk and were told we would be guests later that night at a bamboo flute concert put on by the villagers. 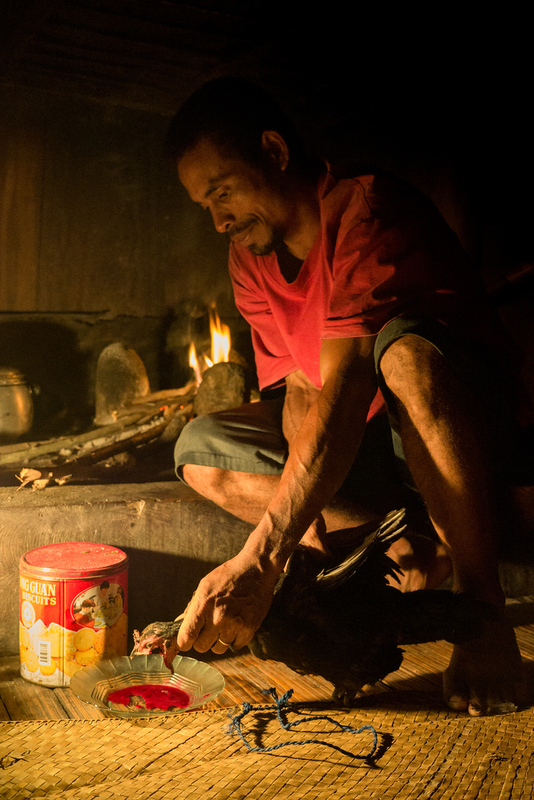 But first, we needed to have a traditional welcoming ceremony, ti’i ka ebu nusi for guests and eat dinner. To the Ngada people, foreigners are considered guests and not tourists. Ti’i ka ebu nusi, ‘give food to the ancestors’, is about introducing guests to the ancestors, to ask for their blessings so no obsticles would come in our way. We were not the only guests at the village, a Dutch family was also staying in the village for the night. 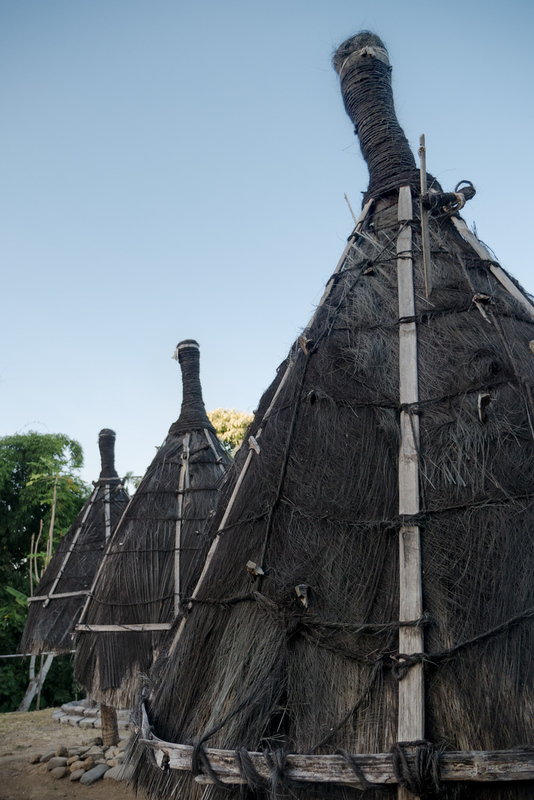 Our welcome ceremony took place in sao one, the most sacred inside part of a Ngada house. Gathering around the hearth in the sao one, our ceremony began with the sacrificing of a chicken. I have never ever seen a chicken killed before, so it was a very interesting experience. It began with a chanting ceremony and the chicken’s beak was sliced open allowing blood to drip onto a pan. We each had to dip a finger in the blood and then smear it on our palms. Chicken blood was then put on all four corners of the room as a blessing to the four spirits. 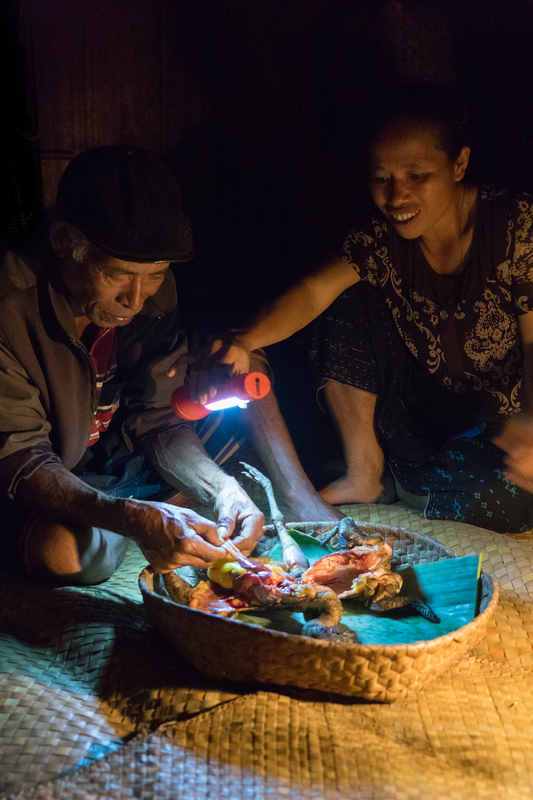 After the chicken had been slightly roasted above an open fire, it was plucked and later given to the village elder, or mosalaki, who split open the chicken to look at its intestines. He read the condition of the intestines, seeing if there had been any incidents on the way to the village and making a prediction about the continuation of our journey. I am not sure if he found what he was looking for since he did spend quite some time examining it. I ended up in the hospital a couple of days later, needing to pass a kidney stone. After examining the intestines, the chicken then became part of a traditional dinner. After dinner, we would go see a concert. The chicken that was sacrificed for us. 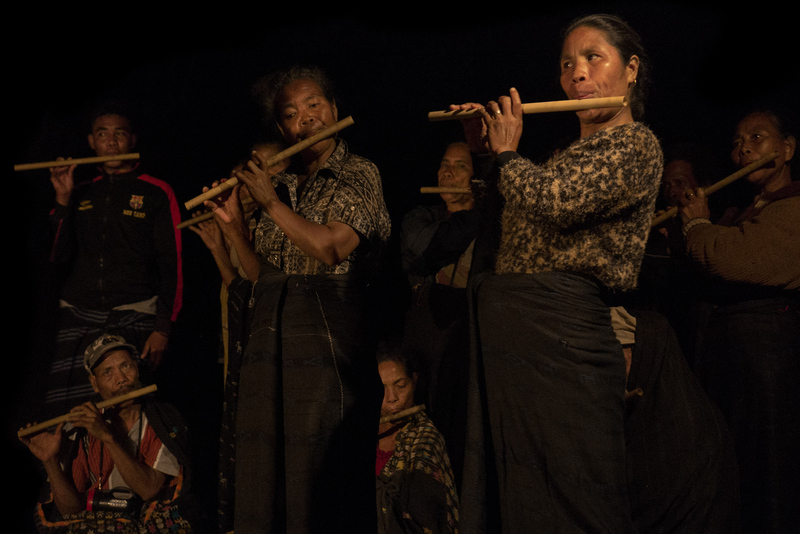 We were lucky that night, coming to the village on a night they would perform a suling concert using traditional bamboo flutes. Sitting there listening to them play under the stars was a special treat. After the concert, we each explained a little about ourselves, giving them an idea of what our lives and culture is like. They were all surprised by the fact that I lived on a ship that jets took off and landed on, never hearing of or seeing an aircraft carrier before. After the concert, we went to sleep the same way they have slept, on wooden floors with a thin mat, feeling very lucky to be staying in the village. 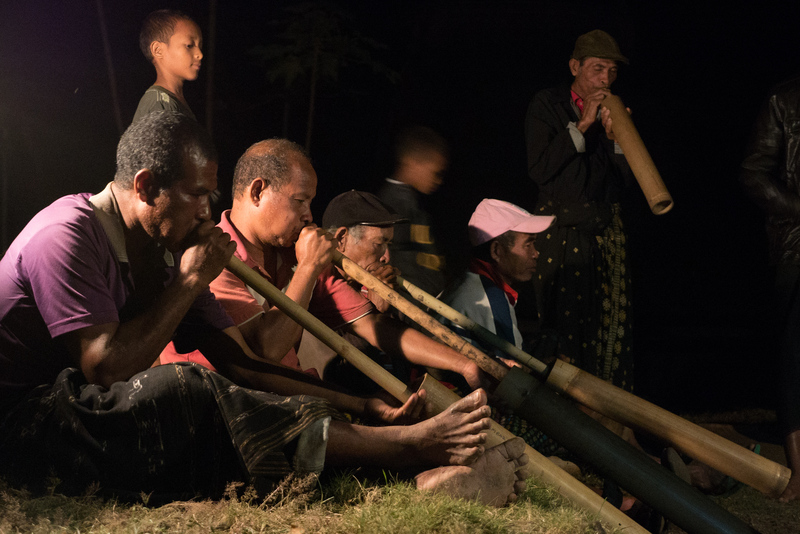 Villagers playing on bombadoms, trombone-sounding bamboo instruments. Playing bamboo flute instruments hand-made by villagers. 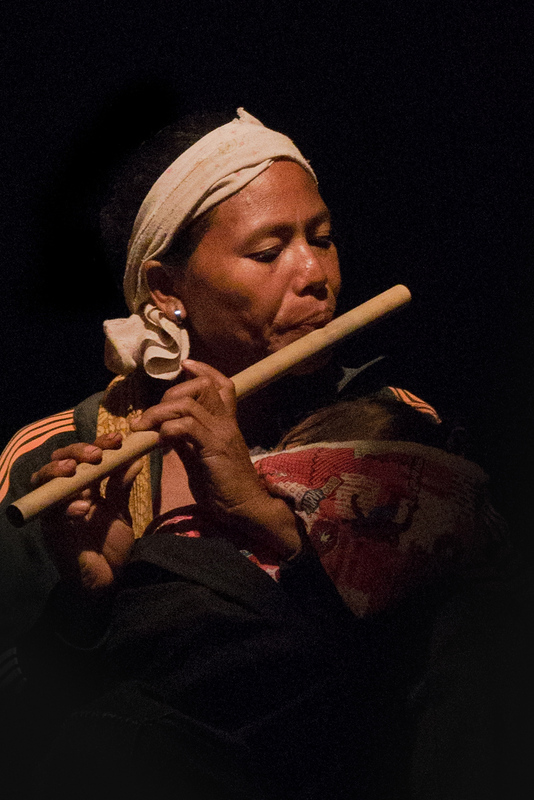 A woman from Belaraghi village playing the bamboo flute. Waking up before dawn, we set out to explore the village before breakfast. It was very quiet in the morning, even after breakfast. 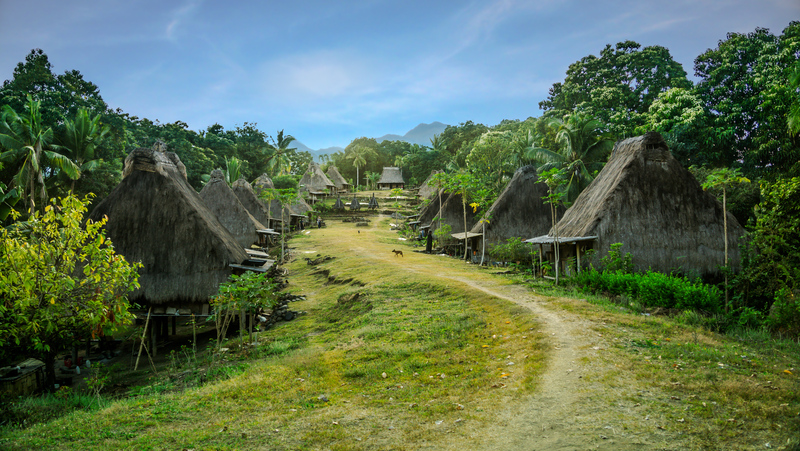 Unlike Wae Rebo, there were not a lot of people who lived in the village. Most of the villagers lived near the beginning of the trail and sent their children to school in the nearby town. With very little activity going on, we spent time dressing up in traditional outfits and just took in the surroundings. Mom and her son and daughter hanging out in front of their house. 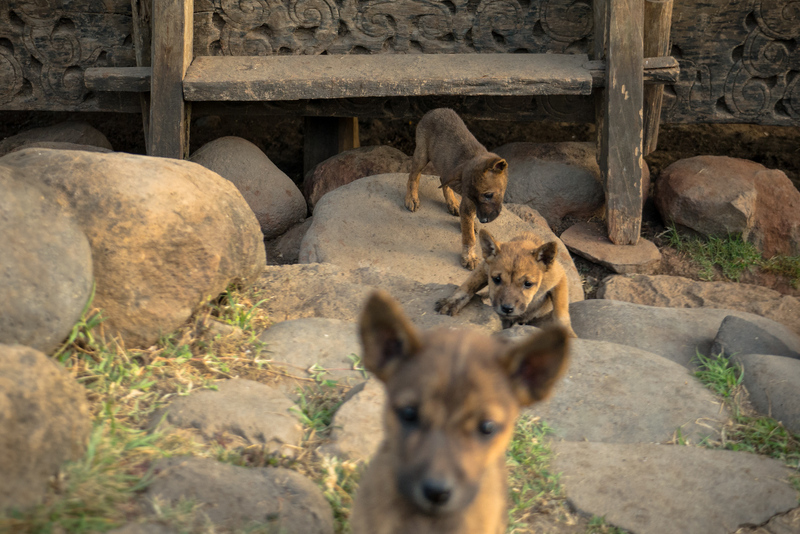 Puppies playing in front of a traditional house with symbolic wood carvings. 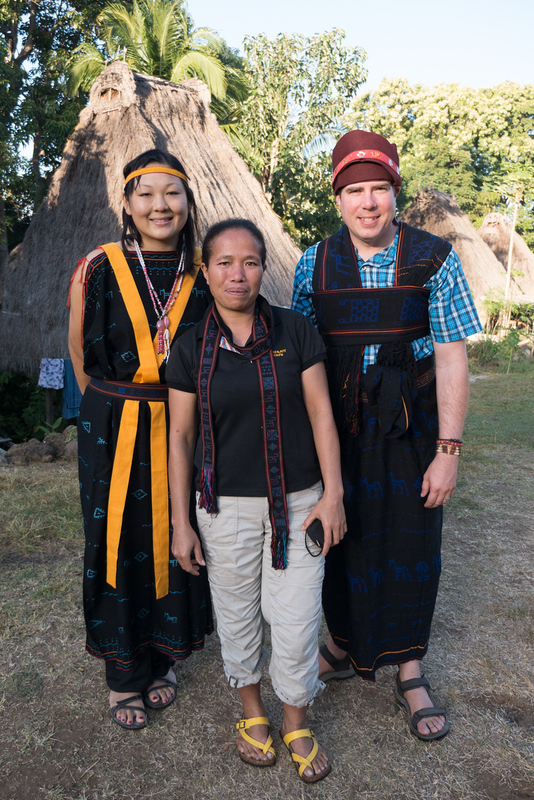 Dressing up in the traditional clothes of Beleraghi village with our guide Rainy. Villager cleaning cassava leaves, a locally grown vegetable for dinner in front of her house. Having many meanings, carvings are an important element of Ngada buildings in Beleraghi. They can be found on the outside and inside of houses. The horse, or jara, which is featured prominatly, symbolizes transportation, trading, and hunting. The chicken, or manu jawa, is a symbol for the continuation of life and is the smallest animal offering. During construction of houses, offerings are required at every step. The snake, or sawa ba’a, is the protector of the house and ancestral spirits, which are thought to reside in the house. 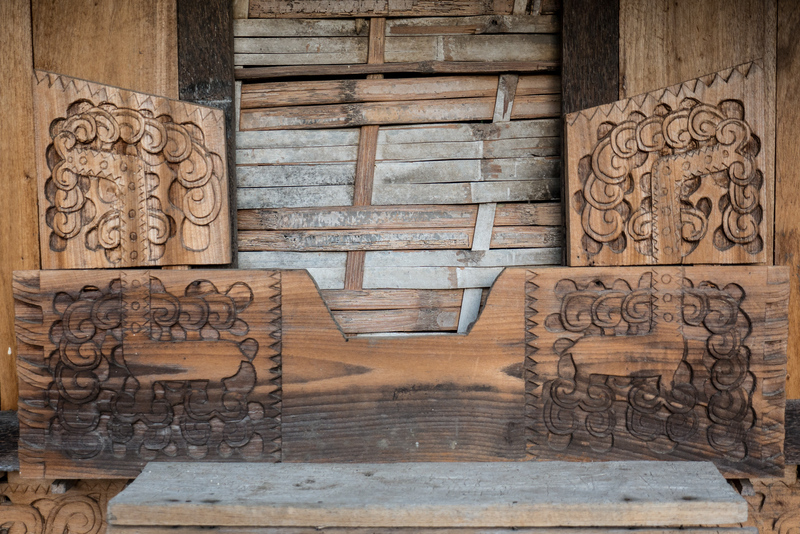 These carvings can be easily found on the bhaga style houses called loka. One belonging to each clan. Carving detail on a bhaga, the entrance to a temple. 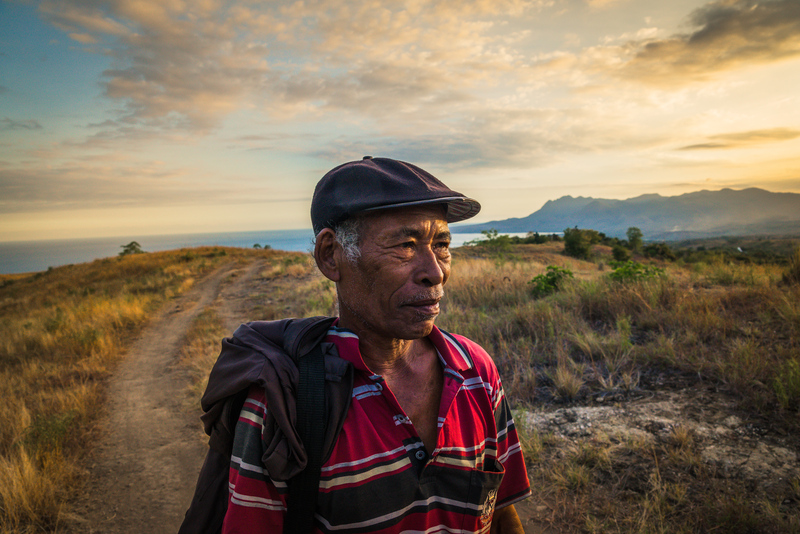 The easiest way to get to Beleraghi village is by hiking the 3km trail that starts at Paukate village. This trail goes through wide-open gasslands with great views of the Aimere coast. From Bajawa, take the Trans-Flores highway towards Aimere. At about 2.5km, take a right turn at the Ende-Aimere junction. After around 35km, at the Keligejo junction, drive to Pauleni village to register in the guestbook and continue on to Paukate. © 2015-2016 Roam to Wonder. All Rights Reserved.